CloudCheckr is joining forces with Mission (formerly Reliam) to deliver the key takeaways you need to know about the AWS Well-Architected Framework. Mission is an Amazon Web Services (AWS) trusted consulting and Managed Services Provider (MSP) for public cloud platforms. Amazon created the AWS Well-Architected Framework to help IT professionals build a secure, scalable, and highly available cloud infrastructure. They did so with Five Pillars, including: Operational Excellence, Security, Reliability, Performance Efficiency, and Cost Optimization. Plus, all live webinar attendees will receive access to a free, 15-minute assessment with a Well-Architected Review expert. 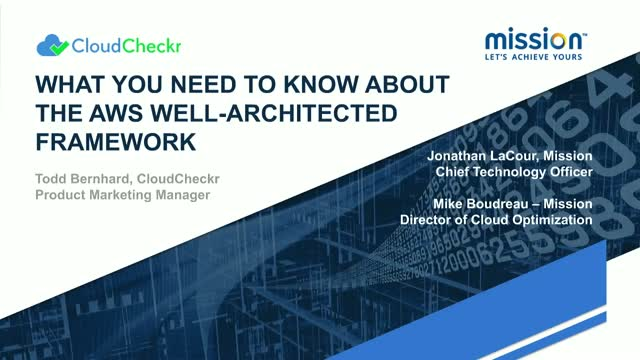 Understand the concepts that make up the AWS Well-Architected Framework and how to use CloudCheckr, alongside the framework, to achieve operational excellence. Download the attached white paper during the webinar.